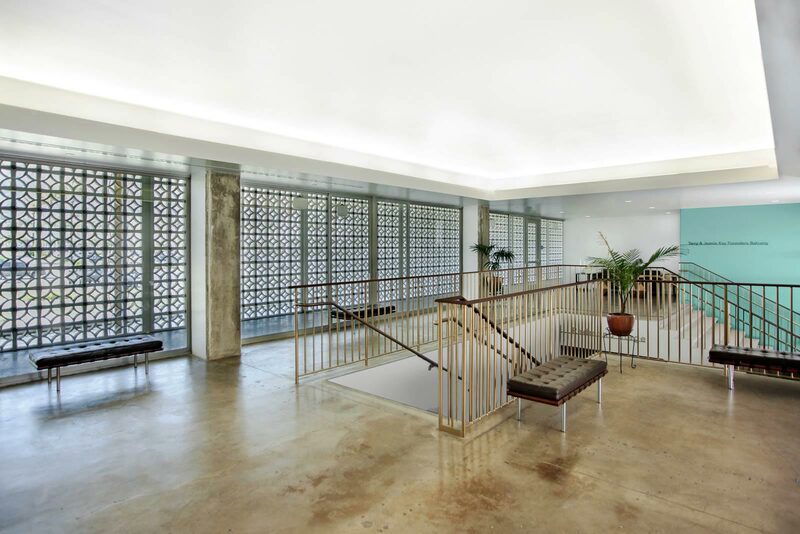 This project, completed in 2011, gives new life to the historic Stuart Pharmaceutical Building designed by Edward Durell Stone in 1958. 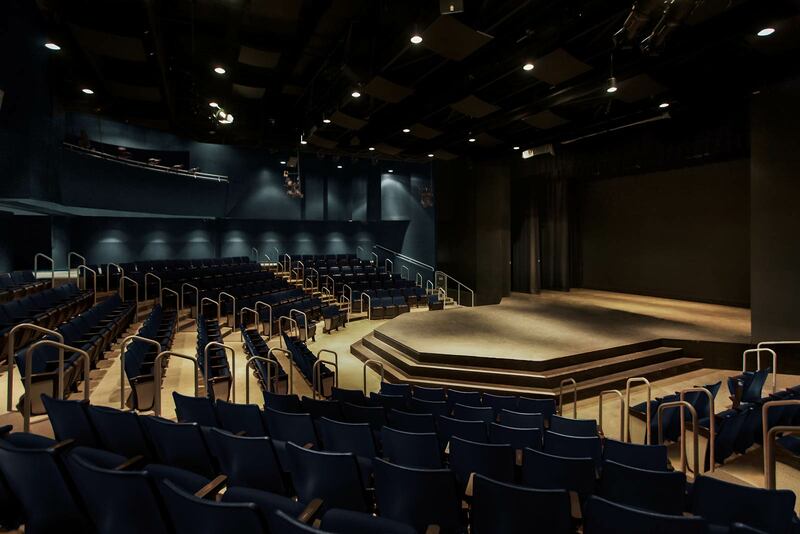 The former corporate office and laboratory complex is transformed into a classical repertory theater featuring a full auditorium, stage, and supporting spaces, while showcasing significant architectural features of the façade and public lobby spaces. Edward Durell Stone made the cover of Time Magazine on March 31st 1958. Behind him in the photo was his most recent accomplishment, The Stuart Company Building in Pasadena, California. 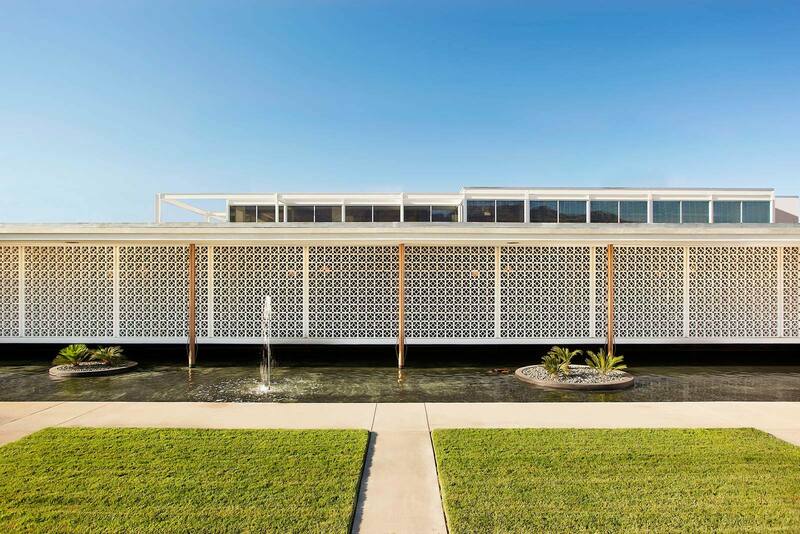 The combined laboratory, manufacturing, and office complex featured a garden designed by Thomas Church, a distinctive perforated concrete masonry unit façade and a vast atrium lobby lit by pyramid- shaped skylights within 81 coffered bays. In 1998 it was listed as a Historic Building on the National Register after having achieved both City and State levels of recognition. 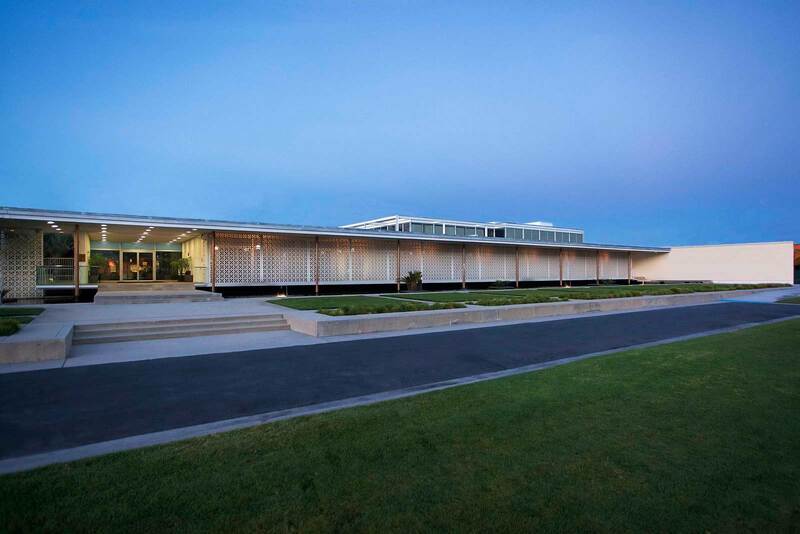 It is important to place this building’s transformation within its historical context. 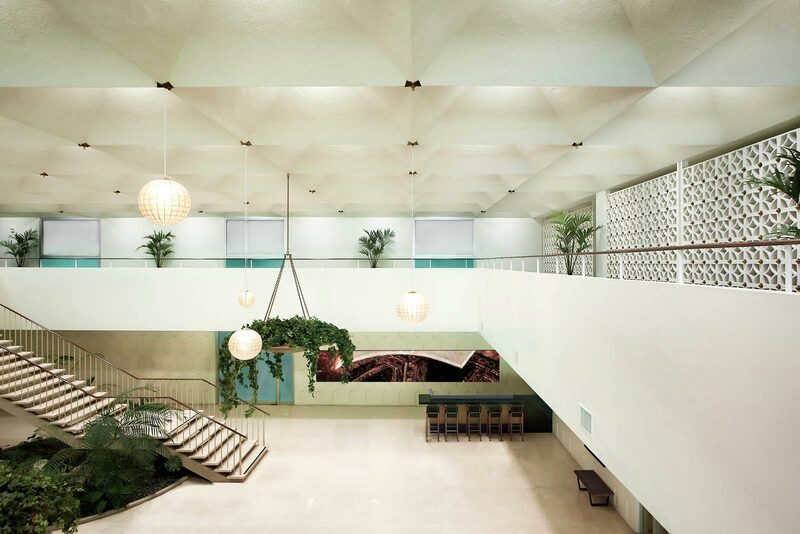 The Stuart Company building was created in 1958 as an ideal corporate workplace complete with employee swimming pool, outside garden spaces, cafeteria, and a large lobby for social functions. 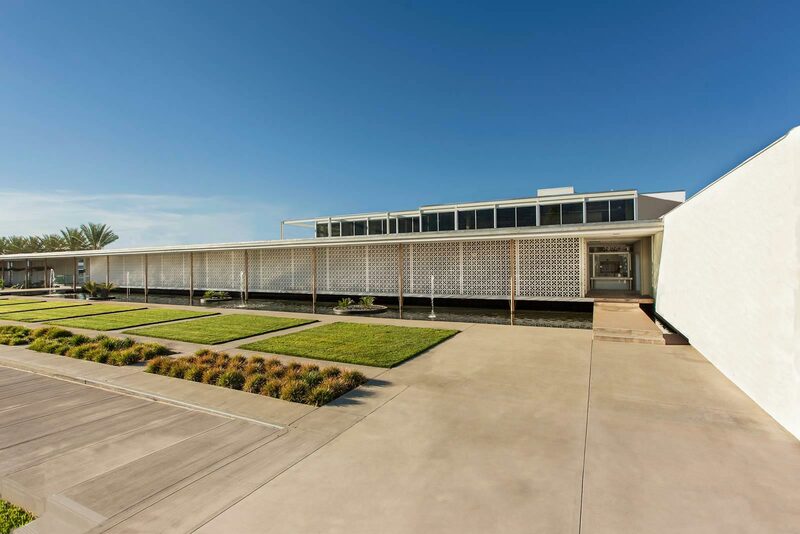 Built before the surrounding suburban area was developed, the company needed this elaborate architecture and amenities to attract employees to relocate and work there. Yet despite these features and its national recognition, by the mid-2000’s the Stuart Company building had been long abandoned. As a large site abutting the Foothill Freeway and the Metro Gold Line (at that time under construction), the land the complex sat on began attracting developers. For these reasons the Stuart Building was considered by the city and preservationists to be an endangered historic building. Eventually the Los Angeles County Metropolitan Transportation Authority (Metro) took control of the site. As the northeastern terminus of the Gold Line was on the Foothill Freeway median directly across from the complex, the site was needed for a massive structure to support a burgeoning regional transit hub. Designed to attract “park and ride” commuters to downtown Los Angeles, the structure - accessible via a pedestrian bridge spanning the freeway- would provide not only parking for 1,000 cars, but also bicycle and motorcycle parking and a bus stop serving four lines. (Fortunately, the parking facility only took a portion of the site, allowing the Stuart Company complex to be preserved.) It was sold to a development collaborative under an agreement that over 350 units of housing would be allowed on the remaining land provided the historic building and surrounding gardens were restored to perfection and that a portion of the space be donated to a suitable non-profit entity. The Stuart Company complex was then divided into zones of varying historic significance, determining the degree of integrity to the original in their preservation. An idea took shape that the original lobby, of highest significance, would be used as a main lobby for the new apartment complex and as space for public community events. The façade and garden were also of primary historic significance, and together their restoration and the construction of the apartment complex to the south were completed as the first phase. For the non-profit component, a Shakespearean repertory theater company would be making two levels of former laboratory space its new home. The advantages for both the theater company and the development as a whole are many. To begin with, the theater’s selection of a previously-developed site reduces land consumption in a sprawling region. 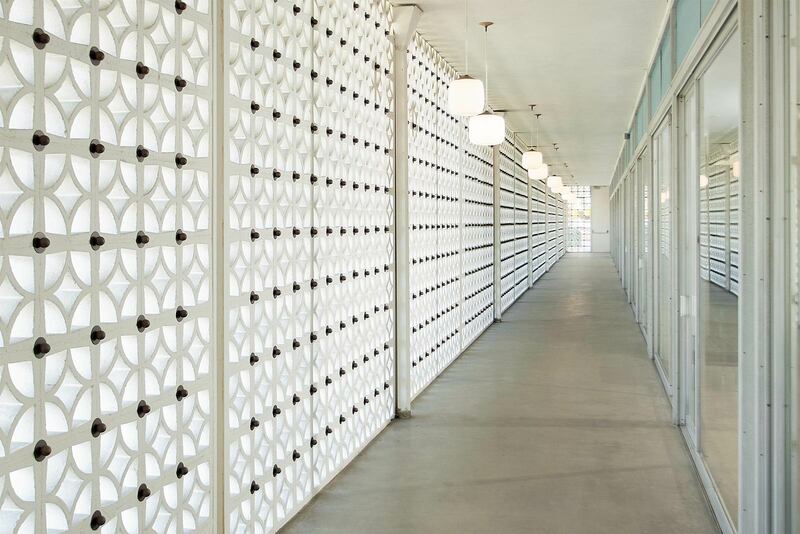 The reuse of an existing building conserves and avoids consumption of more building materials than the construction of a completely new structure. The locality would experience no stress on its street parking as the theater is inhabited primarily outside of business hours, and furthermore all required parking is provided by the Metro structure so no additional land is consumed for parking. The theater contributes to development density by siting itself to take advantage of the existing, robust infrastructure of the adjoining transit hub, while encouraging alternative forms of transportation. It also enhances to the livability –and walkability - of a community devoid of cultural institutions. The story of the new theater’s physical design and construction is one of restraint, respect, and acceptance of the original structure. There is very little precedent for building above and over a historic resource with this level of recognition. Moreover, the design team was tasked with placing one of the most vertical of building types, a theater, within an extremely horizontal building, all the while maintaining rigorous adherence to the Secretary of Interior’s standards for a historic building. 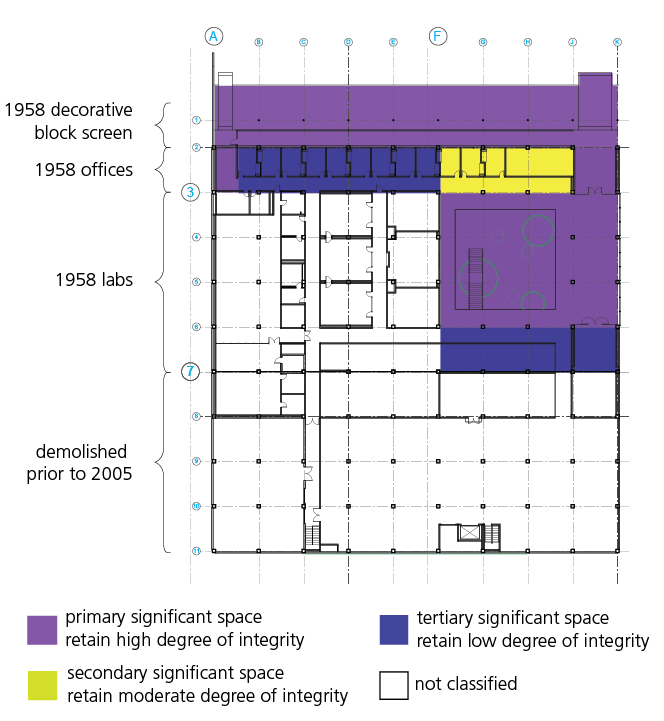 While the laboratory space to be adapted for the theater’s use was determined to have no historical significance and so could be altered, the former office space directly behind it had to retain a moderate degree of integrity to the original. Working closely with the preservation consultant, a design was developed to add an additional story not to exceed 12’-0” – the height of the first level – and to excavate below the building to achieve the minimum necessary height for a properly functional theater. 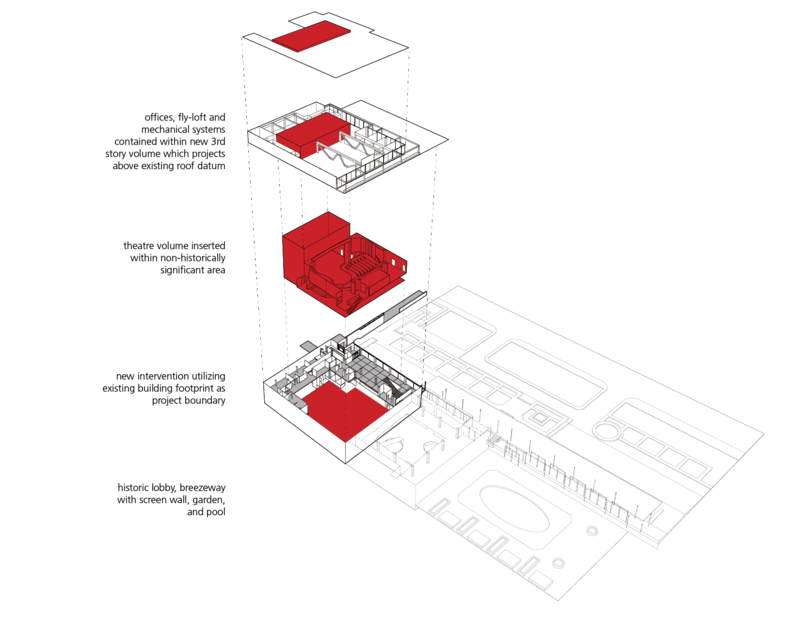 The compact massing encouraged the nesting of programs, with the sunken theater maximizing heat and sound insulation – lowering climate control costs and energy usage – and the office space above profiting from light and views. 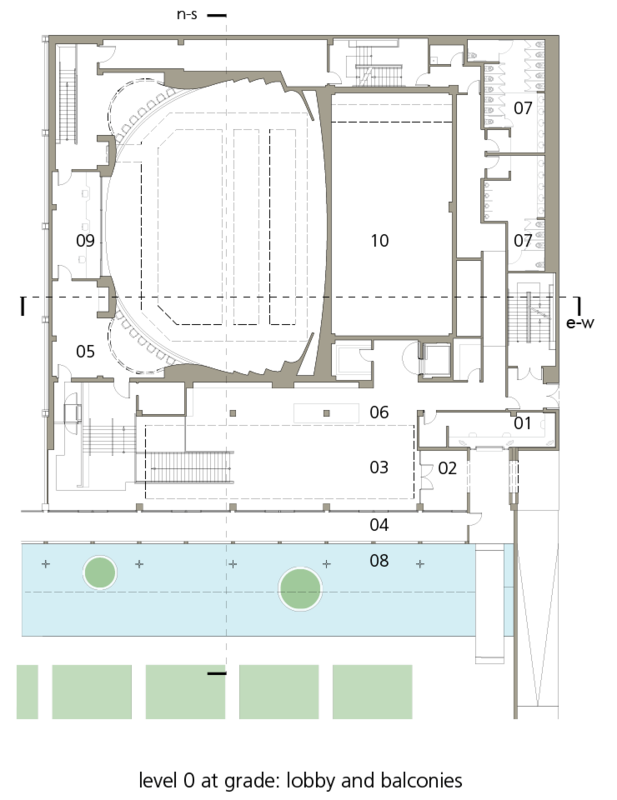 The theater’s administrative program was inserted in the structure of the auditorium. 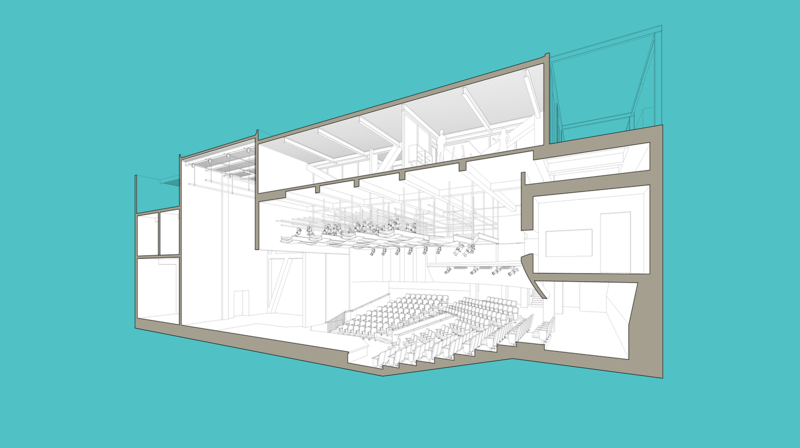 New office space is housed amidst the exposed trusses above the theater’s catwalks, stage and seating area, sharing that level with the upper reaches of the theater’s fly loft and recessed mechanical well. The structure of the third floor was designed to reflect features of the original building, such as the original column grid which may be observed in the exterior steel trellis on the north and east façades, while the advancing and receding volumes reflect the rhythm of the historic elevation below. 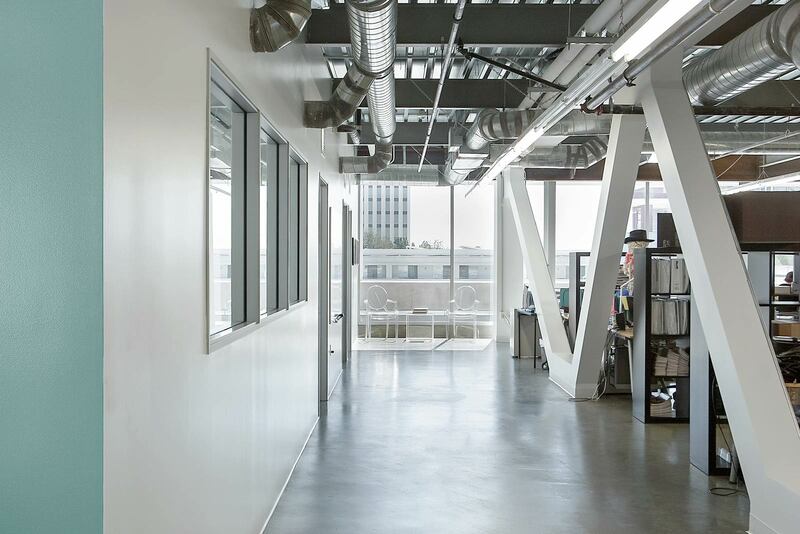 Floor-to-ceiling glazing allows abundant daylighting, which combined with controllable task-lighting helps to reduce energy costs. 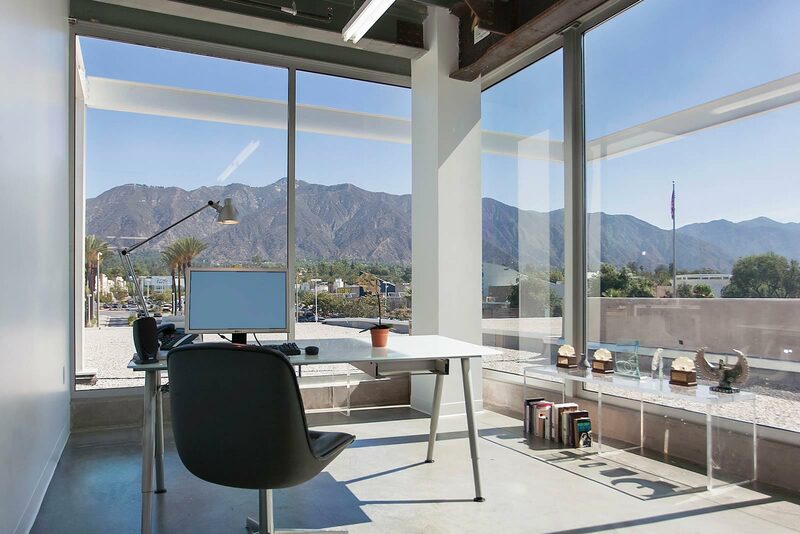 The roof surrounding the offices is covered with historically correct, yet high performing white gravel which both reflects the sunlight to prevent a heat island effect, while diffusing it to reduce glare for office inhabitants. 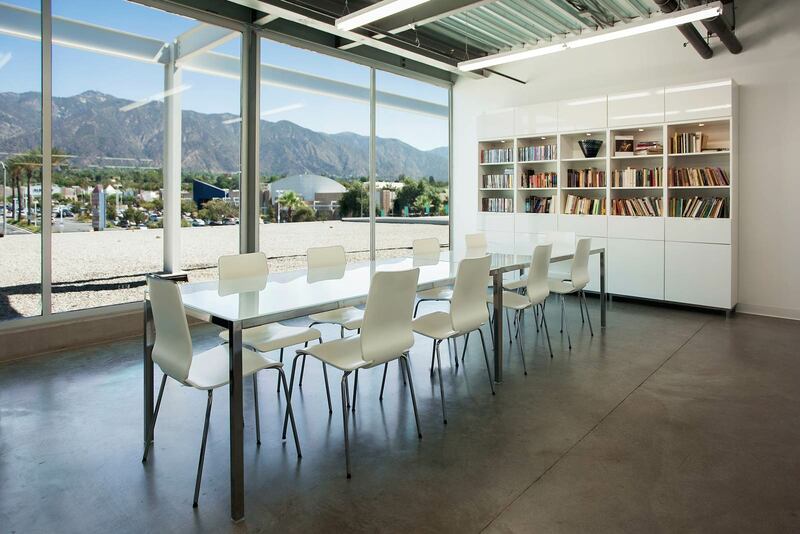 Finally, the open plan and expansive glazing allow workspaces to take advantage of clear views of the Sierra Madre mountain range, providing theater administrators an important connection to the outdoors. The exterior and, now, interior historic façade can be enjoyed by the public before and after theater events. 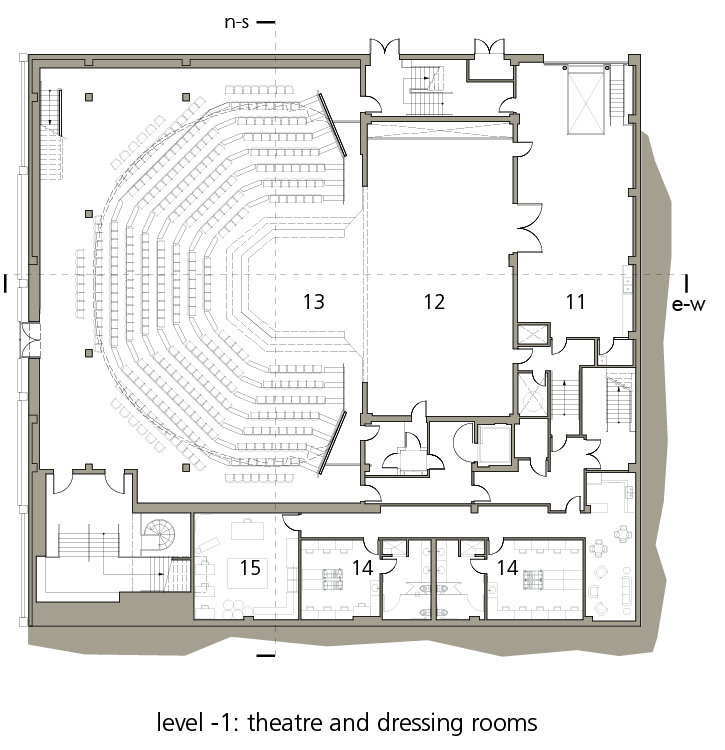 The theater’s auditorium is so situated that it can be accessed directly from both the new ground level lobby and the adjacent, historic shared-use lobby one story below. 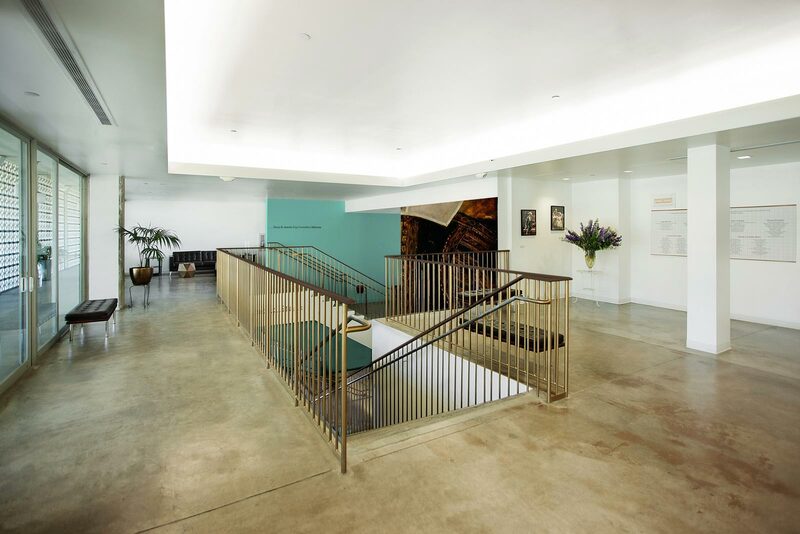 Careful attention was given to the stair composition to create a graceful procession from the new lobby down to both the founder’s mezzanine / balcony level and to the auditorium’s lower level seating. 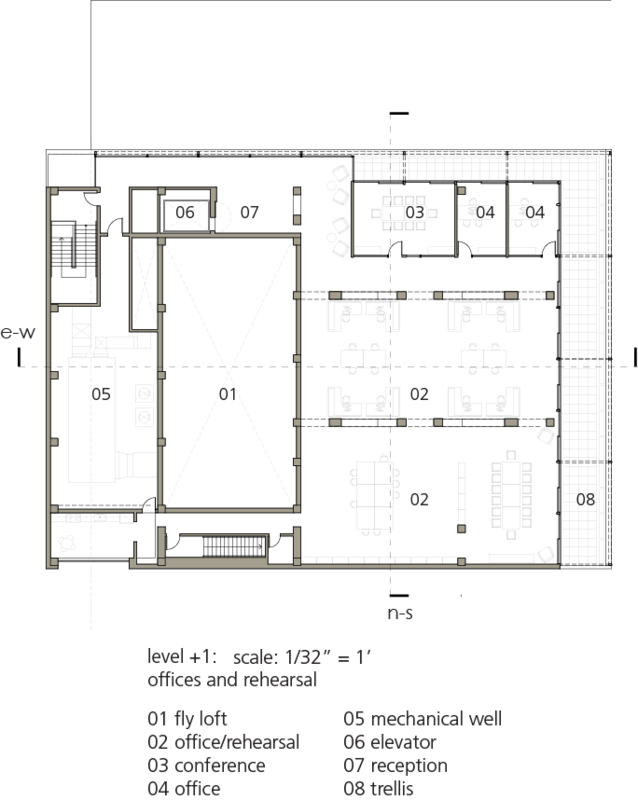 Dressing rooms and back-of-house space are within the former lower level lab space. Behind its dramatically horizontal façade, the theater and its 350 seats are a hidden surprise subtly woven into the historic fabric of this restored building.